In the realm of modern-day professional bass tournaments, it’s common for pros to stack as many as 20 rods on their boat deck in a day of fishing. That’s a nice perk for pros and even semi-pros who have plenty of rods and reels, and a bass boat large enough to hold that many. But what if those pros could only use 10 rods? What if they had to pare down to just five rods? What would they do? Okay, how about three rods? Better yet, what three lures would they tie on their three remaining rods? What precious three lures would make the coveted must-have list of a top-ranked bass pro? To find out we went to 2012 Forrest Wood Cup Winner Jacob Wheeler from Indianapolis, Ind., and asked him to select just three lures to catch fish in any season, any condition and anywhere. The question did not take Wheeler long to address. Within two minutes he cut three lures off his rods and held them out in his hands, giving up the deets on each one. Additionally, Wheeler is fond of reaction baits. First on Wheeler’s list is a Rapala DT-6. When it comes to crankbaits, Wheeler insists that the DT-6 is the most universal one out there. Wheeler usually fishes the crankbait on 12-pound-test Suffix Siege monofilament, but by varying the line size, he can extend its versatility. Second on Wheeler’s list of must-have fish finders is a buzzbait. He prefers a 5/16-ounce Game Changer buzzbait with a custom large blade made by Accent Fishing Products in a white or blue glimmer color. The buzzbait features a heavier gage wire for increased durability and a larger blade to get the lure to the surface quicker and to be worked at a slower speed. While most bass anglers might consider a buzzbait to be a window-specific lure relegated to just early morning and evening summer-time fishing, Wheeler argues a buzzbait is one of the most over-looked versatile tools in a tackle box. One of Wheeler’s biggest buzzbaits secrets is to pitch it like a jig to bushes, logs and laydowns. For most of his buzzbait fishing Wheeler prefers to fish it on 17- or 20-pound monofilament. He typically trails it with a color-matching Gene Larew Biffle Bug or Biffle Bug, Jr. Speaking of a Biffle Bug, that just happens to be Wheeler’s final pick to complete his must-have trio of bass baits. 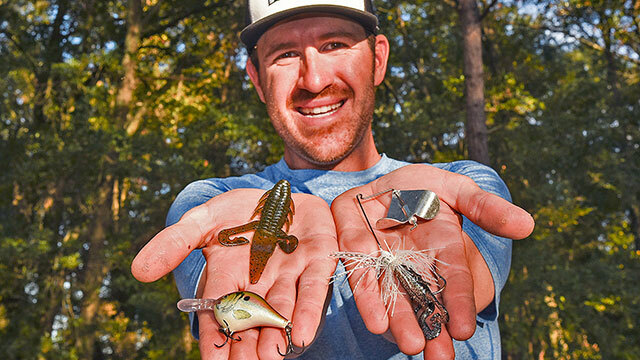 Wheeler picked the Biffle Bug creature bait due to its ability to be several lures in one, as his buzzbait trailer proves. “I’ve already picked two moving baits, but I know I need a soft-plastic in there, too, and the Biffle Bug can fit so many situations, so that’s what I’m going with,” Wheeler explained.